Copper Harbor has a new APP! The App is a work in progress and will have more info added throughout the next couple months. These updates will automatically load on your app. Visit the App Store and search “Copper Harbor” You’ll see the App at the top with the photo above. Load it today! Is today the day you breathe deeply and be revitalized by the freshest air on Earth? How about biking down the side of a mountain on a world-class trail system. Perhaps you will spend your time on the beach hounding rocks with the waves gently lapping at your feet. Or immerse yourself in the history of the copper boom in this wild and wondrous place. Travel miles of rugged back country through incredible scenic beauty. You might decide to skim the surface of Lake Superior as you glide gently by the lighthouse on a sea-kayak tour. Or take a cruise to catch a freighter while watching the sunset. Enjoy a fine meal, explore the quaint shops and galleries, play a round of mini golf then sit back in the evening and if you’re lucky, the northern lights will put on a show. Tomorrow is too long to wait. Copper Harbor…where the road ends and adventure begins. 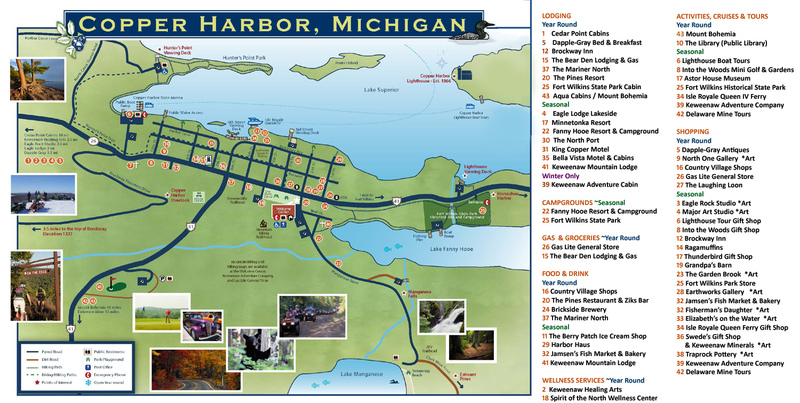 A trip to Copper Harbor is off the beaten path, but that’s what makes it nice. Plan to spend some time and hang out for a while..….you won’t be disappointed! The friendly people, affordable prices, fresh air, fine cuisine, unique shops, amazing scenery, historical significance and options for outdoor recreation combine to enhance the whole experience. There is so much to see and do, many features are unique to the area. Take time to see it all! Copper Harbor is also the Gateway to Isle Royale National Park. The Isle Royale Queen IV takes visitors to the cherished island 50 miles away in about 3 hours.